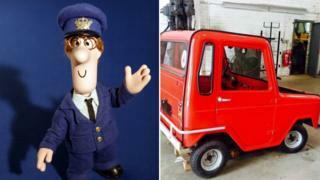 Thieves who stole a replica Postman Pat van from a Cambridgeshire farm could be hard-pressed to sell it after the crime was widely publicised, its owner said. The van, owned by a Pymoor-based crisp firm, was taken late last month. Postman Pat's black and white cat was on board and is also missing. Police appealed for the return of both last week, as reported in the Ely News. The owner is offering a £2,000 reward or "a lifetime supply of crisps" - but he did not know how many that might be. Ross Taylor, who owns Corkers Crisps, paid about £800 for the 1972 William micro-car at auction about four years ago. His mechanic spent months turning it into a replica of the BBC character's red post van. The van comes complete with a soft toy of Pat's cat Jess and was used to publicise the company's products. It had been stored in an outbuilding and its theft was noticed when the family went to get it ready for the coming season. "It's very complicated to start, so I think they must have lifted it onto a truck," Mr Taylor told the BBC, adding: "It's quite light but would have taken several people to do that." After the theft was widely reported in the local press and shared on social media, Mr Taylor said he hoped the publicity would "make it difficult for the thieves to sell on". "I don't think they knew it would get so much attention." As an alternative to a £2,000 reward, anyone knowing the whereabouts of Postman Pat's van and cat could claim "a lifetime's supply of crisps". Asked how many bags constituted "a lifetime's supply", Mr Taylor said: "I have no idea. I just really want my car back." Cambridgeshire Police said: "While Postman Pat is now struggling to deliver the post, we feel confident that this distinctive vehicle will be recognised if it is seen out and about."